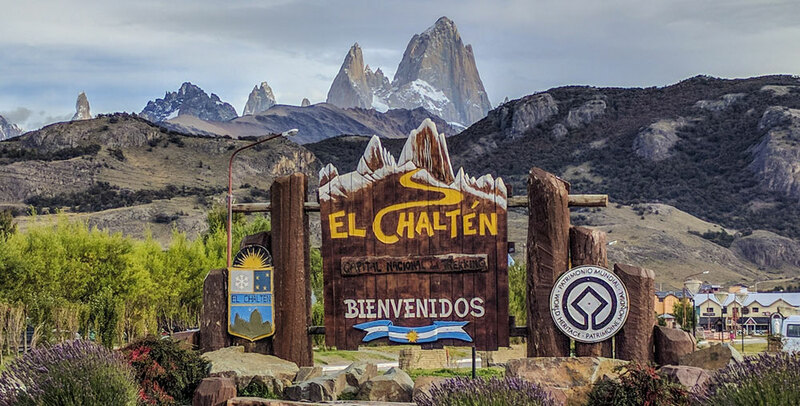 I woke up in El Chaltén, fairly hungover from the previous day’s liters of wine, and stumbled out of the bus terminal to this. The southern stretch of our Patagonia adventure would not include much biking but we replaced it with hiking. 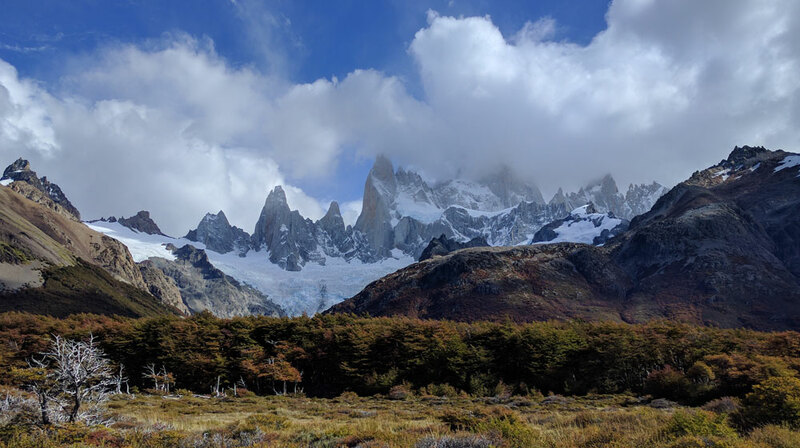 We spent several days camped in El Chaltén in the front yard of a hostel, hiking around Monte Fitz Roy and spending each evening at the local burger joint. 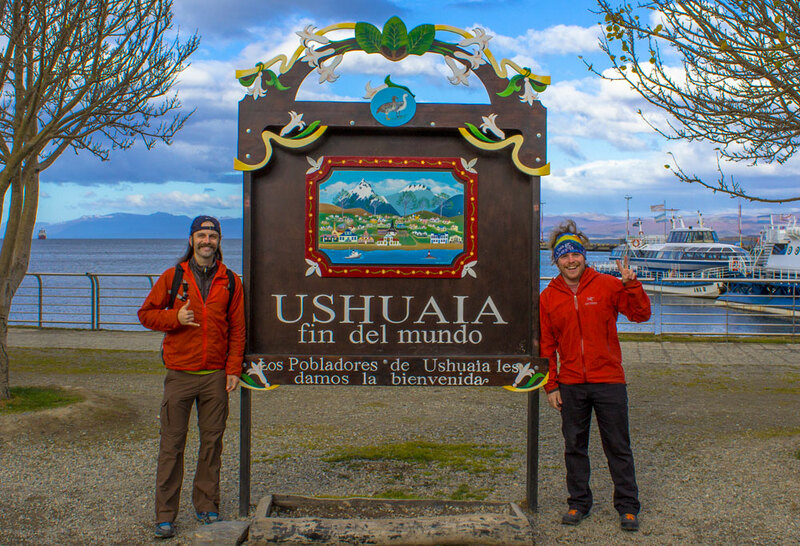 With so many international outdoor enthusiasts around it was easy to forget that we were in South America. From El Chaltén we caught a bus to El Calafate and quickly hopped another bus to Rio Gallegos. We heard that a bus ran from Rio Gallegos to Ushuaia every few days and that it might have space for our bikes. Or, it might not. We camped near the bus terminal and the day we departed for Ushuaia our tents were covered with frost. Winter was settling in, we’d missed a lot of Patagonia, but we had a week before flying to Buenos Aires and we wanted to visit the end of the world. Ushuaia is just about as far south as you can get. We spent the better part of a week in a biker friendly hostel, meeting new friends, feasting on fresh crab, and drinking too many Beagle beers. One morning we assembled the bikes and rode a few kilometers out to Tierra del Fuego National Park and the southern terminus of the Pan American Highway. Ushuaia was the longest stop during our bike tour, and my personal favorite. I would have enjoyed staying longer to explore, hike, and try to find a way to Antarctica, but winter was rolling in and our flight to Buenos Aires was departing. We packed the bikes in boxes and hired a truck to the airport. A few hours later we landed in Buenos Aires to warmer weather and prepared for the last leg of our El Grande Sur Adventure.